Ability over Disability. Leading the Church one Sunday. I’ve had a crazy and yet wonderful few weeks planning and getting ready to lead two services at our church, which happened last Sunday. 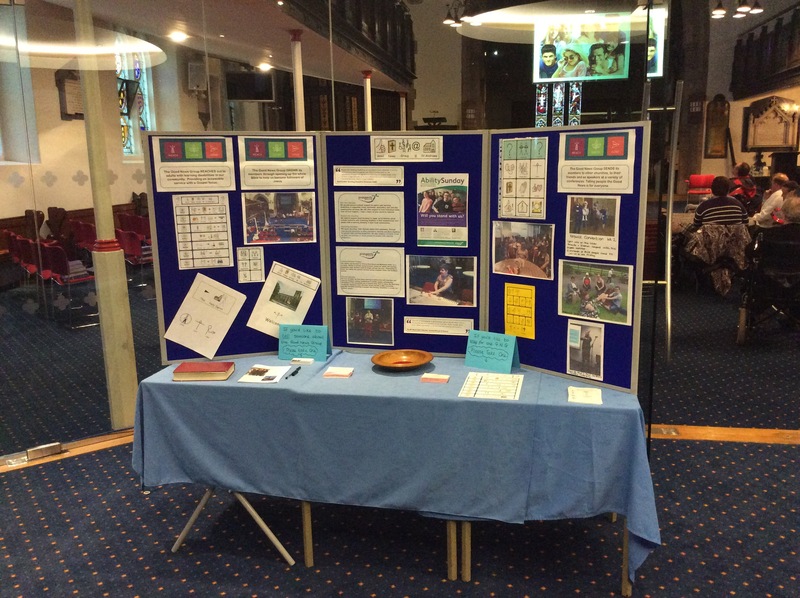 We really wanted to join Prospects (www.prospects.org.uk) for their Ability Sunday celebrations and thought it was a great way to show the rest of our church just how much the Good News Group loved Jesus and being part of his body. You know from my previous posts that we believe in ABILITY over disability. We purposely organise the service part of our meeting with a similar structure (however wonderfully different, too) to the Sunday services. This is so that the adults with learning disabilities that come on a Wednesday would feel comfortable, familiar and could contribute to any Sunday service they can get to. Well, on this Sunday they did just that. Our vicar suggested that we led the Harvest services and made them Ability Sunday too (harvest in our church is a low key affair, just a family service with offerings and prayers for the food bank). So we did. Two morning services, one repeated schedule and as many of the Good News Group as possible being given chance to show what they are ABLE to do. 1) The logistics of actually getting the GNG members to church on a Sunday were greater than getting them to our service on a Wednesday evening. The time was different/too early (even though we have 2 services one much later than the other), Carers weren’t on the right shift. They didn’t have transport. 2) But those who did come were excited and willing to serve. One couple stayed for both services, doing a different role in each. We were only able to get 6 out of 30+ members (and a parent and a carer) there in the end. We showed photos and had a display of the rest of the group to make up for this. 3) GNG members joined the welcome team, read the Bible (Easy English version) and said the prayers. I lead the service and Bob and other team members did the puppet sketch. Lorraine signed all the songs, along with GNG members and children from the congregation . What was nice about this?- the GNG members are quite proficient at signing and they were the ones sharing their expertise with the church. So there you have it. I have heard some great testimonies from other churches who celebrated Ability Sunday too. We really should do this more often so it doesn’t have to be done. If every Sunday could just be perfect, for everyone, then we wouldn’t need Ability Sunday…. ….But actually, we’re not going to worry about that. Sundays are only one day of ‘church’ in our community. There is ‘church’ going on every day, whether it’s in the main building, church hall, local schools, nursing homes, house groups, on the streets, people’s workplaces and wherever the congregation meets together to study, pray, fellowship and serve together. We love our Wednesday meetings and we know the rest of the congregations love us and see us as part of the whole church. But it will be fun to plan the next service we lead….